For safety reasons, storing uncooked chicken in the freezer is a good idea. Freezing chicken slows down the reproductive cycle of dangerous bacteria like salmonella (though it doesn't kill them), and helps ensure your dinner is safe. On the other hand, freezing your chicken generally means having to defrost it, and you've got to do that properly, or risk letting those salmonella bacteria run rampant. Another option is to cook the chicken from frozen. Yes, it's possible! The biggest challenge is making sure it's cooked all the way through. Besides the fact that undercooked chicken can be a safety hazard leading to food poisoning, it's also no fun to eat. Indeed, frozen chicken is arguably safer to handle than fresh or thawed chicken, because it won't drip salmonella juice all over you or your kitchen counter. Below we describe our two recommended methods for cooking frozen chicken: simmering and in the oven. But let's get one thing out of the way before we go any further. The food safety experts at the U.S. Department of Agriculture advise not to cook frozen chicken in a slow cooker. The reason: Slow cookers are designed to cook at a low temperature, and the slow-cooker might not get hot enough to heat frozen chicken all the way to 165 F, which is the minimum temperature for a chicken to fully cook, as well as to destroy any dangerous bacteria. That, or it might take too long to reach 165 F, giving bacteria a chance to multiply. Moreover, the USDA does not distinguish between new slow-cookers, old ones, middle-aged ones, or any other designation, including so-called "hot cooking" slow cookers or what have you. A slow-cooker is a slow-cooker, and from a food-safety standpoint, none of them are appropriate for cooking frozen chicken. It is safe to cook frozen chicken in the oven or on the stovetop, however. That includes whole chickens as well as any smaller portions thereof—boneless or bone-in. And by stovetop, we mean simmering. Adding a frozen item to a pan of hot fat is a dangerous thing to do, as water will make the hot oil spit out at you and can cause burns, or more serious issues. So don't try to sauté a frozen chicken breast. Grilling frozen chicken, on the other hand, is not a good method as the high temperature of a grill will cause the outside of the chicken to burn by the time the frozen interior is anywhere near cooked. So what does that leave? Essentially, simmering and roasting (or baking). The general guideline you need to know is that it will take around 50 percent longer than if you're starting with a chicken that is fully thawed. Thus, if a 5-pound chicken would normally take 1 1/2 hours to roast, a frozen one would take at least 2 hours and 15 minutes. However, because of the extended cooking time, it's not a bad idea to cook it at a slightly lower temperature, so if a recipe calls for a 400 F oven, cook it at 375 F instead. If you do this, you're probably looking at double the cooking time vs. 1 1/2 times. But don't go lower than 350 F.
You could also cook frozen boneless chicken breasts by simmering them in your favorite jarred or homemade sauce. Again, allow 50 percent additional cooking time. For frozen boneless chicken breasts, cover and simmer for about 30 minutes, but check for doneness either with an instant-read thermometer or by slicing (there should be no pink). For frozen bone-in chicken thighs, drumsticks or whole leg pieces, plan on simmering for about 90 minutes. The advantage with dark meat sections is that when the meat falls off the bone, it's done. For this technique, if you are preparing multiple frozen breasts, they must be separate, not frozen together in a single slab. Arrange the breasts in a single layer on a sheet pan. Brush the breasts with olive oil, mustard, yogurt or melted butter, and season with Kosher salt and freshly ground black pepper. Optional: top with a mixture of seasoned breadcrumbs and grated Parmesan. Bake for 30 to 45 minutes or until their interior temperature reaches 165 F.
This technique will work for a smallish (4-pounds) whole frozen chicken. Position the chicken breast-side up on in a roasting pan with a rack. IF YOU CAN: Remove the bag of giblets, and stuff the cavity with sliced lemon, fresh herbs, aromatic veggies, etc. If the bird is too frozen, do this later. 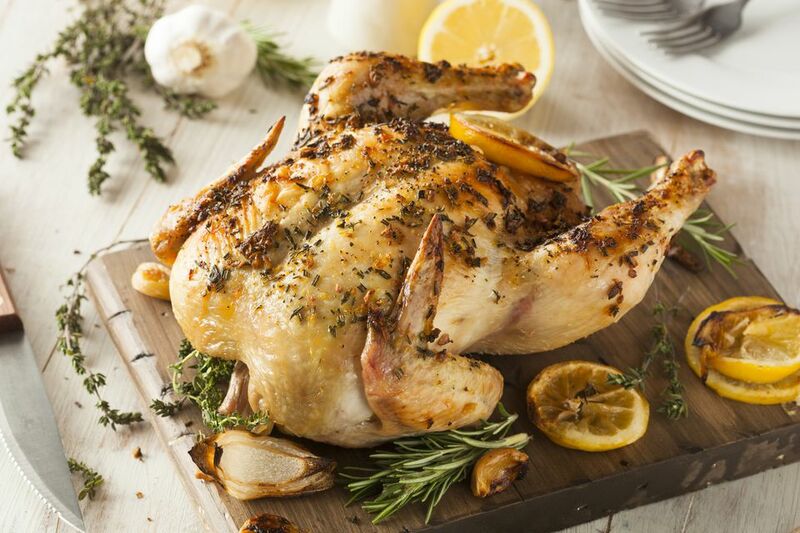 Brush the bird with olive oil, and season with Kosher salt and freshly ground black pepper. Roast uncovered for 90 minutes. You should be able, after about 1 hour, to remove the giblets and add your herbs and aromatics (but don't repeatedly open the oven to check). Increase oven temperature to 450 F and cook another 15 to 30 minutes, or until the skin is browned and the temperature in the deepest part of the thigh registers at least 165 F on an instant-read thermometer (although 175 F at the thigh is better). Rest the bird for 15 to 20 minutes, then carve and serve.